English: St. Helena waxbill, barred waxbill, brown waxbill, pheasant finch; French: Astrild ondulé; German: Wellenastrild; Spanish: Astrilda Común. 4.3-5.1 in (11-13 cm). Sexes are alike. Juveniles are paler than adults and have fainter barring. 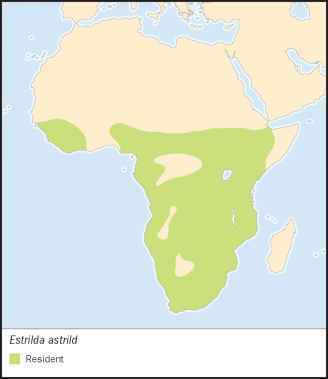 Found naturally in southern Senegal, east to Ethiopia, south to South Africa, essentially throughout most of sub-Saharan Africa. Has been introduced in Brazil, Portugal, and many islands throughout the world including Hawaii, Tahiti, the Seychelles, Bermuda, and Puerto Rico. Prefers areas with tall grass including marsh, reed beds, abandoned cultivated areas, gardens, grassy clearings or paths, and farms or plantations. Being highly gregarious, this species is found in small flocks during the breeding season and larger flocks when not breeding. Calls include a "chip," "tchic," and "pit" while the song is described as a "tcher-tcher-preee," although it can be highly variable. Feeds mainly on a diversity of seeds taken both from growing plants and off the ground. Swarming termites as well as other insects make up a small portion of the diet. Builds a pear-shaped nest of grass stems at or near the ground. Four to six white eggs are incubated for 11-12 days. 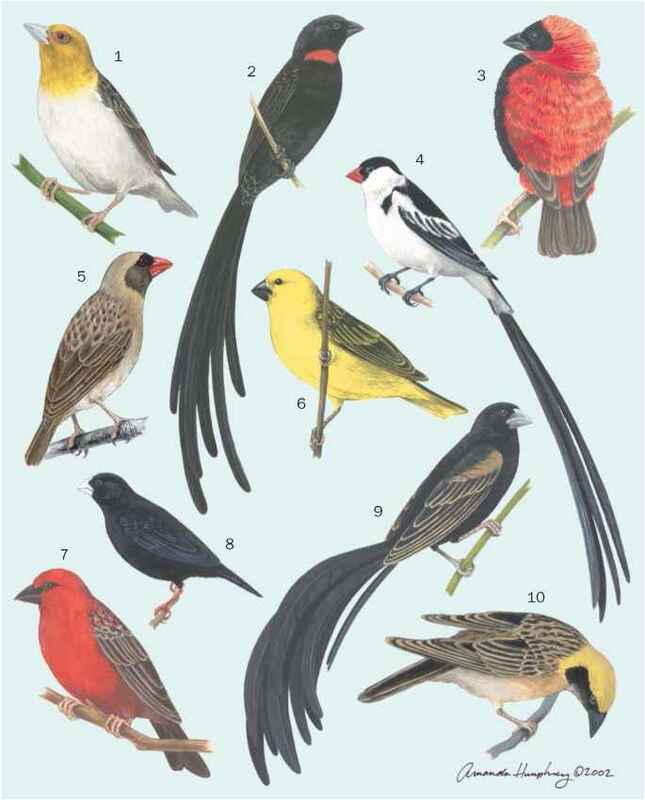 This species is the brood host for the pin-tailed whydah (Vidua macroura).